Critically acclaimed Melbourne indie-folk darlings Tinpan Orange enter their tenth year as one of Australia’s most loved brother-sister outfits. With the ethereal and mesmerising Emily Lubitz at the helm, joined by her brother, guitarist Jesse Lubitz and violin virtuoso Alex Burkoy, Tinpan Orange’s 60’s inspired folk has a melancholy, candid and somewhat playful edge. Emily’s distinctly angelic voice coupled with Jesse’s harmonies and sensitive guitar melodies and Alex’s gypsy-inspired strings continue to occupy that sad and heart-warming world that is distinctly Tinpan Orange. 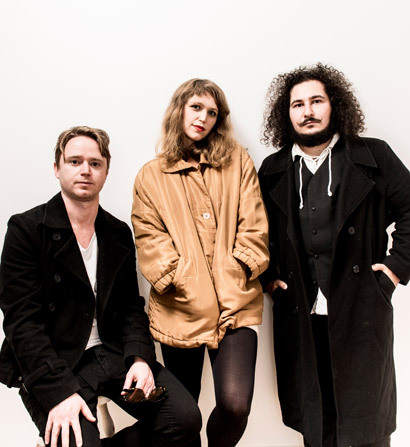 In 2013 the band won Triple J Unearthed with their catchy folk-pop single Barcelona, and the album ‘Over The Sun’ was nominated for The Age Music Victoria’s Best Folk Roots Album. Emily’s voice also appeared on one of the greatest viral sensations the world had seen, The Metro’s Dumb Ways to Die advertisement. Having shared the stage with Martha Wainright, The Cat Empire, The Waifs and Husky, and playing some of the world’s biggest music festivals including WOMAD, Laneway, Calgary Folk Festival and Winnipeg Folk Festival, Tinpan Orange’s music has grown a fanbase that stretches across the globe. Join Tinpan Orange on Facebook.